Life tends to change all the time and mostly – at the moment one expects the least. What we have today may no longer be there for us tomorrow. Dreams that die today, may be broken and yet get a second chance on the next day and fill us with hope and determination once again. But how far can the power of the will alone take us? Often, when one is inspired and determined to quit their bad habits, it carries a temporary nature. It seems to have its own expiry date. But how to keep that determination permanently? What must be done to revoke one’s final attempt to hold onto life? Especially, when that same life seems to have done everything to turn off all the lights at the end of the tunnel? Difficult to answer, right? Worry not! There is no need to get upset. Lisa France’s documentary film “Roll with me” has all the necessary answers to reassure you that life is the most beautiful gift we get. We must unwrap and enjoy it to its fullest no matter how stormy the road is for us at any given stage of our lifetime. “Roll with Me” follows the main protagonist – Gabriel Cordell. Despite his physical condition, Gabriel embarks himself on an incredible journey to roll on an unmodified wheelchair from one coast of the U.S. to the other by leaving behind 3,100 miles and 70,000 feet. Throughout his journey, starting from California and finishing in New York, Gabriel changes the life for many, including his nephew Christopher, who has his own inner monster to defeat – his drug addiction. The film has an emotional start and it never slows down even for a second. It starts with archival footages of Gabriel and his family. We learn about his dreams and his determination to become an actor. In 1992, two months after his 22nd birthday, Gabriel is on his way to a professional audition. He gets hit by a car on the red light. That accident sends him into a paralyzed condition. Unable to feel anything below his chest, Gabriel’s biggest challenge now is to accept his situation. It isn’t until the age of 42, that he realizes he has the power of will to do something extraordinary. That pushes him to fulfill something that has never been done before – to become the first person to roll across the United States in a standard wheelchair. His quest is going to end in his hometown of West Hempstead, New York. 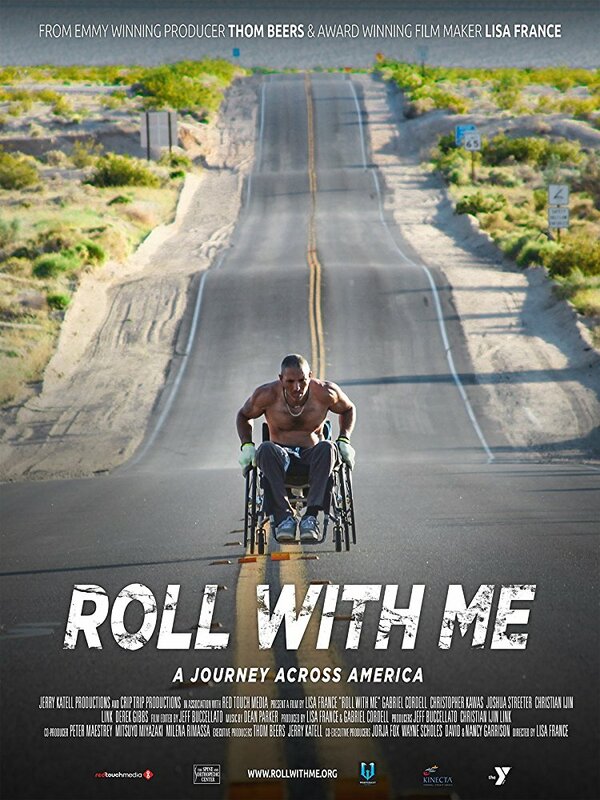 If you are going to watch the charming and inspiring documentary “Roll with Me”, be prepared to leave your tough side outside the auditorium and be completely absorbed by the film. You are about to experience a heart-warming journey that will shake you to the core. The true beauty of Gabriel’s story is how he manages to bring all kinds of people together and unite them throughout his journey. Meantime, he helps his nephew Christopher. Same as Gabriel, Christopher has an addiction to drugs. Even though by the time of his quest, Gabriel has left the damaging habits behind, he is determined to help Christopher to do that as well and to become a new person at the end of the road. In conclusion, Lisa France’s “Roll with Me” is the most important documentary film that has to be seen by every individual on this planet. I am saying this not because it has touched me so deeply but because it has a power to heal a broken heart, depression, and even a frustration from life. It gives hope for changes, it has its own reset button to restart any life. Finally, after seeing what has been achieved by Gabriel, you will come to a conclusion that the only thing that is impossible to do – is resurrecting the dead. If you are still alive, every problem is possible to fix. It just might take a bit more than a willpower. I am sure, everyone will find something to discover for themselves after watching “Roll with me”.